MOUNTAIN VIEW, Calif. — There are few things in this world I despise more than software updates. Downloading hundreds of files, waiting for the progress bar to fill, restarting the device — it’s all a thankless chore. Usually. 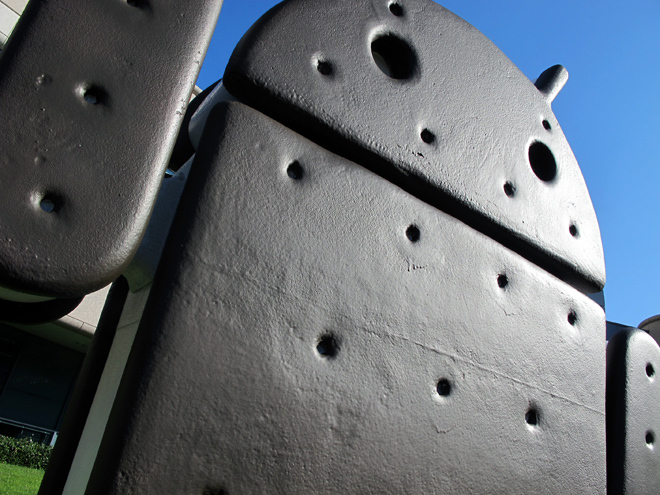 But Google’s Android 4.0 operating system, better known by its tasty nickname “Ice Cream Sandwich,” or ICS, is far from a mere mobile OS update. Ice Cream Sandwich is a complete OS overhaul that includes tweaks ranging from the geekily esoteric (widget resizing!) to the most surface-level of interface improvements (think “shinier,” care of faux-polished surfacing effects). It’s also destined for both Android smartphones and tablets, unifying Google’s mobile OS platforms for the first time. Google invited me to its Mountain View campus for hands-on time with the Samsung Galaxy Nexus, the flagship device on which Ice Cream Sandwich will launch sometime in November. Android Vice President of Engineering, Hiroshi Lockheimer, gave me a deep-dive tour of the new software, and, by the time I left, I was stoked to upgrade to one of the most anticipated Android releases to date. 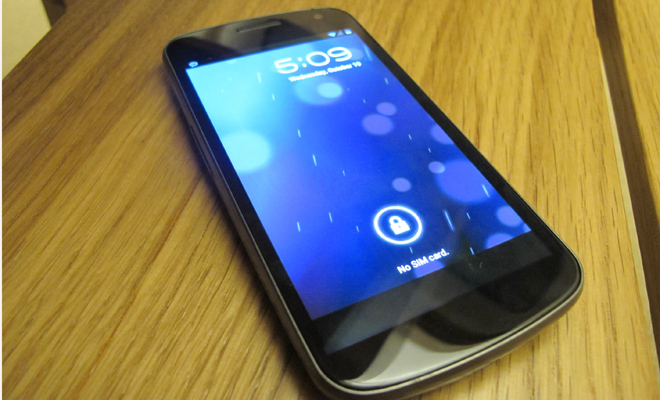 Ice Cream Sandwich will make its debut on the Samsung Galaxy Nexus. Relative to competing mobile OSes, Android’s release cycle runs at a breakneck pace, with major software version releases debuting about every six months. Lockheimer began working on Android over five years ago (before Android was really “Android”), and he’s survived nine different version launches in about four years. In that same four-year period, Apple iterated its iOS just four times. The Android team’s mandate to continuously iterate is admirable, but according to Lockheimer, it accounts for some of Android’s so-called roughness. Nonetheless, Ice Cream Sandwich is the closest to a “finished” version of Android I’ve ever seen. The team spent an incredible amount of time on refining the little things, from changing details as minor as the opacity of the notifications background (it’s now translucent, so you can see the app tray beneath it), to as major as redesigning the phone’s lock screen to look more like that of Honeycomb (aka Android 3.0, Google’s current tablet OS). It’s this collection of subtle touches and flourishes that comprise an enormous change in overall OS feel — a whole much greater than the sum of its parts. The new Roboto font, shown here on various parts of the display, will inevitably look like Helvetica to most people. Even Android’s system-wide typeface was reimagined. “Roboto,” Android’s new official font, is spread across all parts of the OS containing text. Android user experience chief Matias Duarte says the font serves a dual purpose — “modern, yet approachable” with mechanical forms underscored by a “cheerful demeanor.” I think it’s pleasant to look at, even if it does appear to be a variant of Helvetica. In order to appreciate the biggest interface changes in Ice Cream Sandwich, you must first consider that it’s essentially a union of Android’s phone and tablet interfaces, two drastically different UI designs intended for entirely different form factors. The new OS makes obsolete all the physical buttons currently gracing Android smartphones, replacing them with virtual keys (just like those first introduced in Honeycomb in February). Similarly, home screen widgets are now moveable and resizeable, and organized under a new tab in the app menu. 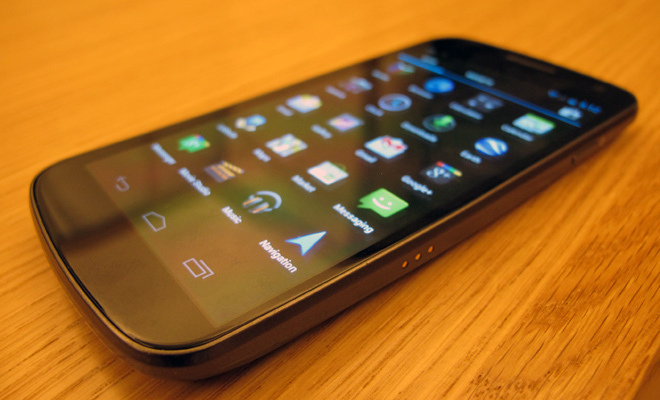 The Samsung Galaxy Nexus lacks the physical button bar of previous Android phones. In a strange amalgamate of added security and high-tech playfulness, the new “Face Unlock” uses the front-facing camera to scan and verify your face before granting access to your phone. The feature uses advanced facial recognition technology developed by Pittsburgh Pattern Recognition, a company Google acquired earlier this year. While Face Unlock looks pretty darn sweet, reliable functionality is (currently) hit or miss. It worked about three out of the five times I tried it, and it quite publicy failed to recognize a Google employee during the Ice Cream Sandwich launch demo in front of international press. Regardless, you can still use a backup PIN or pattern entry code to unlock devices, so you and your unrecognizable mug won’t be left out in the cold. Yep, that's my face. Please let me in. 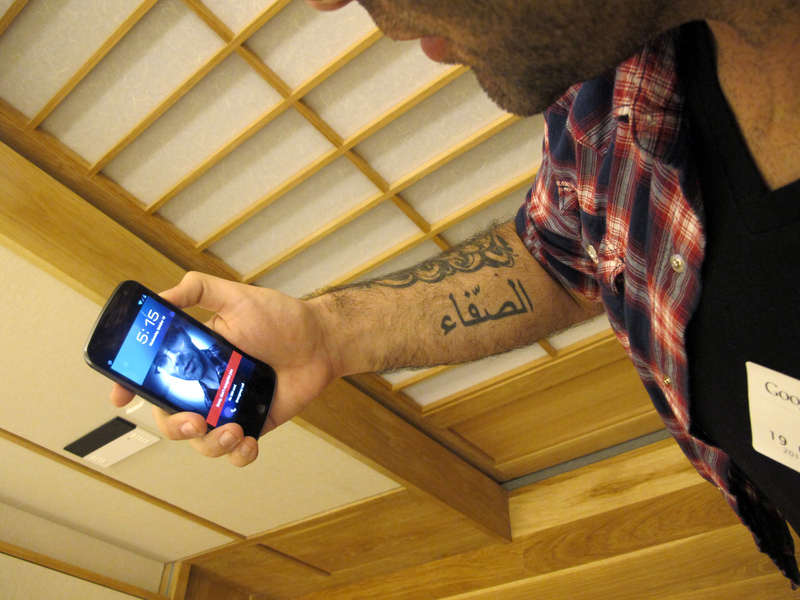 What’s more exciting than a phone that knows your face? A phone that plays well with others. Using Near Field Communications (NFC) technology, you’ll be able to share content between Ice Cream Sandwich devices with “Android Beam.” By tapping the back of your phone to the back of a compatible handset, you can swap web pages, apps and whatever else Google or software developers enable for transfer in the future. Google has trumpeted the benefits of NFC ever since launching the Nexus S smartphone last year, asserting that the technology will soon change the way we use our phones in the course of everyday life. For example, Google Wallet — a major Google e-commerce initiative supported by CitiBank Mastercard, with more credit companies on the way — allows users to pay for purchases at retail stores with simple waves of their smartphones (assuming, of course, the retailers have the proper NFC reader technology installed). I was bummed that Lockheimer wasn’t able to show me Android Beam in action when I visited — his Galaxy Nexus was running a different build of Ice Cream Sandwich than the demo unit I held. Regardless, sharing web pages between phones isn’t the Android Beam feature that really excites me. We should all be more interested in the NFC innovations that haven’t yet been announced. Imagine being able to ”encircle” one another using our Google+ accounts with a mere tapping of phones. Or perhaps exchange contact info with a quick Nexus bump. Who knows, maybe in the future a quick Android Beam tap will be good enough for a marriage license in Las Vegas. The possibilities are as frightening as they are endless.